Pythagoras made his name with his and Einstein spent more than a decade developing E=MC^2. But this Christmas you can buy a place in mathematical history for your very own genius and name a theorem after them forever. 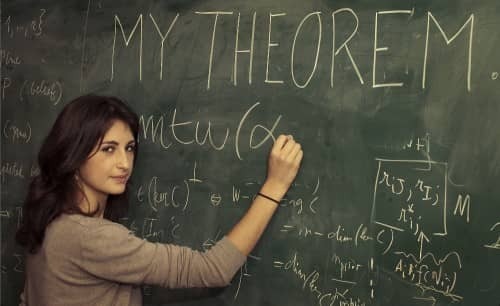 As a new novelty gift idea , TheoryMine is giving you the chance to name a newly discovered and totally unique mathematical theorem after your loved ones, teachers, friends, pets and even yourself. So if you know someone who dreams of becoming the next Pythagoras but balks at the thought of thousands of hours of academic study, a personalised theorem could be the perfect gift. TheoryMine generates theories using one of the world’s most advanced computerised theorem provers and your theorem, once proved, stays true forever. Even diamonds will be destroyed in the heat death at the end of the universe, but theorems will survive. According to mathematical tradition, the author of a theorem is entitled to name it for posterity and for just £15 you can buy your own personal theorem. A certificate of ownership is included in the price. The reasoning in the proof of the theorem is deductive, so contains no element of probability or uncertainty. Since theorems are abstract objects that are not subject to wear and tear you can promise your loved one that you have bought them a gift that will last forever. To find out more or to purchase your theorem, visit www.theorymine.co.uk.